In a large skillet, sauté ground chicken 6-8 minutes; adding garlic, chipotle pepper, paprika, cumin & salt while breaking up ground chicken and pepper as fine as possible. Stir in the tomato sauce; bring to a boil, reduce heat and simmer ten minutes. Meanwhile heat the tortillas as package directs. To assemble Chipotle Chicken Tacos: scoop the Chipotle Chicken on the warm tortillas, top with shredded Monterey Jack cheese with Jalapeno Peppers, a spoonful of guacamole and sour cream. Squeeze a wedge of lime over the taco and serve. Another great Taco Night! 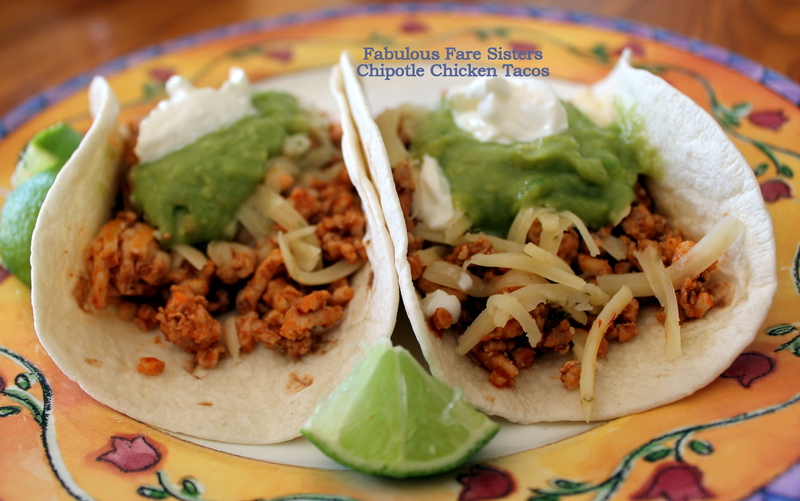 This recipe has been shared on Saucy Saturdays,Fiesta Fridays and Throwback Thursdays! It’s also been shared on Turn It Up Tuesdays, and Happiness is Homemade, along with Totally Terrific Tuesday, What’s For Dinner, Recipe of the Week, Lou Lou Girls Fabulous Party, Cook Blog Share, Cook Once Eat Twice, FoodieFridiy, FoodieFriendsFriday and Melt In Your Mouth Monday! Go check it out and find many other delightful recipes and ideas! Yum!! Beautiful photos to showcase this dish! So delicious and easy. Haven’t made tacos in a while. These are going on the weeknight list this week. Thanks for joining the party at Saucy Saturdays. Hope to see you there again this week! Fabulous share Linda! I bet that was one awesome Taco Tursday!! 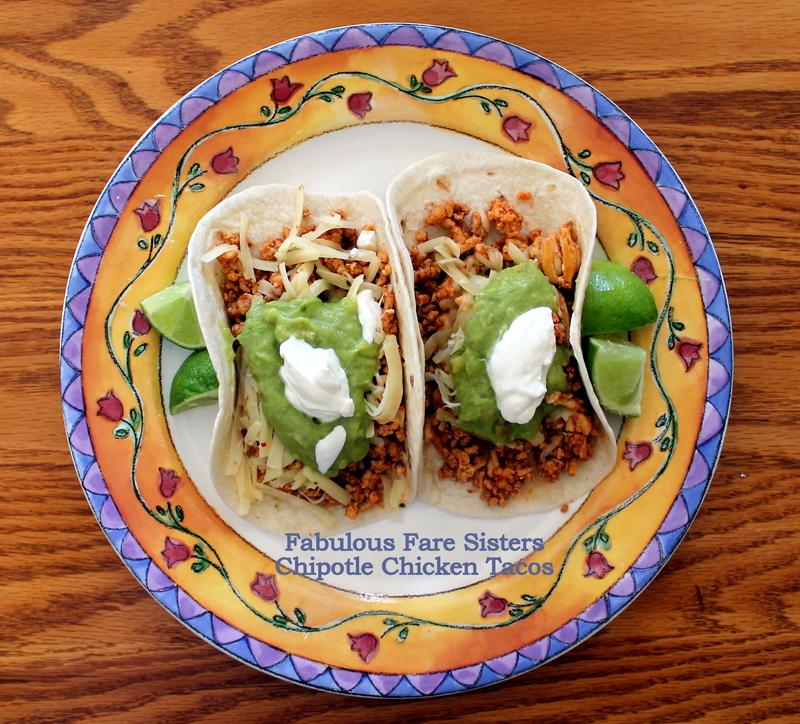 I love tacos any way you make ’em – and these look really good! Thanks for sharing on the “What’s for Dinner” linky party! These sound really delicious! I can never resist tacos! Thank you so much for joining in with #CookOnceEatTwice. This looks great. I know some people in my family would love it! Pinning. I love me some tacos, heck yeah! My kids would love these, they look so good! Looks so mouth watering good. Happy Tuesday. Oh my goodness! I wanted to lick my screen this looks very tasty! This looks so good. Love the idea of fresh food even though everything is covered with snow. Me too! I love being snowed in with a warm oven ready for comfort food or bakery!